For the second year in a row, C&IS’ Bateman Team has been named a finalist in the Public Relations Student Society Association’s Bateman Case Study Competition. The competition is PRSSA’s premier national case study competition for public relations students, providing them an opportunity to apply their classroom education and internship experiences to create and implement a full public relations campaign. This year, UA’s Bateman Team partnered with the Campaign to Change Direction, an organization founded in 2013 whose mission is to change the culture of mental health through promoting mental health as equally valuable to physical health, raising awareness of the signs of emotional suffering and encouraging the care of personal mental well-being and the mental well-being of others. PRSSA Headquarters received 67 entries for this year’s Bateman Case Study Competition. Fifteen submissions received honorable mention, and three were named finalists. The finalists will present their campaigns to a panel of judges May 10 in Chicago. UA’s Bateman Team placed first overall in last year’s Bateman Case Study Competition. Of this year’s finalists, The University of Alabama is the only returning finalist, but the Bateman Team isn’t feeling the pressure. 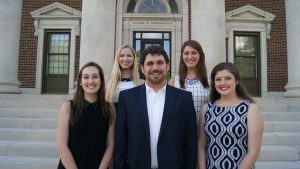 The five members of UA’s Bateman Team are Danielle Cassady (Athens), Colton Cumbie (Monroeville), Nicole Morgan (St. Petersburg, Florida), Laura Ritchie (Mobile) and Lauren Williams (Cedar Rapids, Iowa).